All the Good Ones Are Not Taken. Now there’s a way to win the love game and find the right man for you: It’s called GuyTypes. 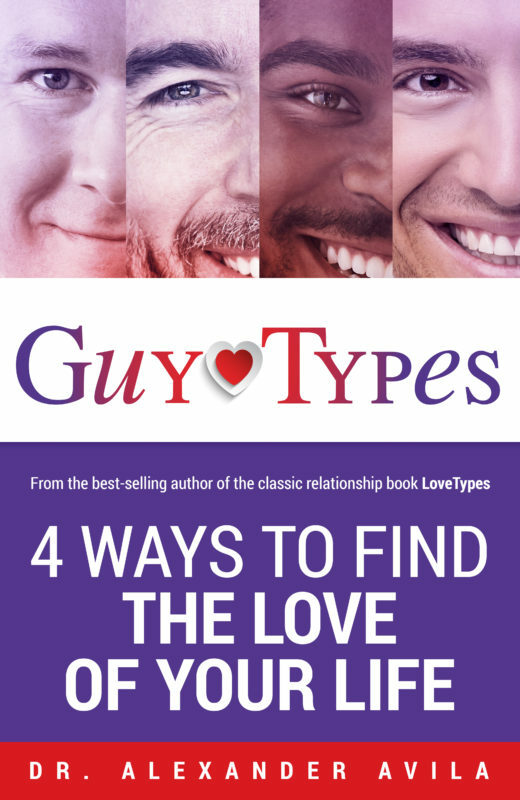 In GuyTypes, bestselling author and award-winning psychologist, Dr. Alexander Avila, introduces a revolutionary new love finding paradigm. Streamlining his classic bestseller LoveTypes (over 40 million followers), and combining social networking with Myers-Briggs Type compatibility, Dr. Avila unveils a groundbreaking system for finding true love in our fast-paced technological world. Meaning Seeker (NF): 13.5% of the male population. If you’ve ever wanted to be romanced like a goddess, then this is the right guy for you. Sensitive, imaginative, artistic, philosophical, poetic, and a true romantic: He is the lover of all lovers. Knowledge Seeker (NT): 14.8% of the male population. You’ve met your “Iron Man”: Brilliant, powerful, innovative, and ultimately successful. His incredible brainpower will stimulate your mind (and body), and his incisive, witty take on life will keep you intrigued and fascinated. Security Seeker (SJ): 43.1% of the male population. You’ve found your rock: steady, reliable, traditional, and family-orientated. He is the loyal husband and loving father who will be by your side for life; there is nothing he won’t do for you and the family he loves. Excitement Seeker (SP): 28.6% of the male population. Get ready and fasten your seatbelts—the fun is about to begin. This charismatic and confident guy will bring as much fun, laughter, and enjoyment into your life together as humanly possible. Quickly profile his personality type by asking 3 Magic questions or making micro-observations about his behavior. Use Personality Networking and the latest social media tools to break the ice and get to know him. Win his heart by tapping into his unique personality type preferences. Rate his sexual compatibility (including cheating risk), fatherhood ability, and long-term relationship potential. Develop a lasting relationship and marriage with the love of your life. With GuyType’s proven compatibility paradigm, you will eliminate the frustration and disappointment of failed relationships, and you will finally find the man you can love for a lifetime.